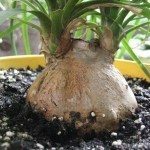 I have a ponytail palm that I put outdoors in summer and have to bring indoor in the winter. I live in IN and I have noticed the pot which the plant is in is full of ants in the soil; they are coming in and out the drainage holes and they've reproduced. What can I do so that I don't bring the ants in with the plant? Is it okay to repot this time of year or is their a safe insecticide? I do have a cat inside my home. Thanks!